Home > News > One room, many lifestyle options! One room, many lifestyle options! Within Trevu House, we have a true ‘multipurpose room’ that plays host to many weekly lifestyle options. 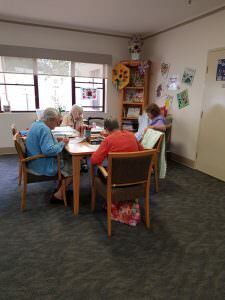 Art therapy: This group of ladies gather on a weekly basis to either draw or paint using watercolours or pencils, and their work is displayed upon completion. Woodwork: Five to six men attend on a weekly basis to hone their woodworking skills (often over a beer)! In the past, they’ve built and painted letterboxes and toolboxes, and are now in the process of constructing money boxes. 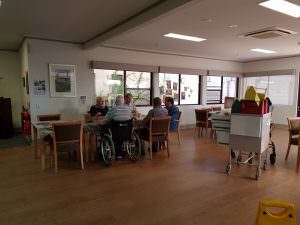 Concert: Rick, a relative of one of our residents, comes in weekly to play Australian folk songs. 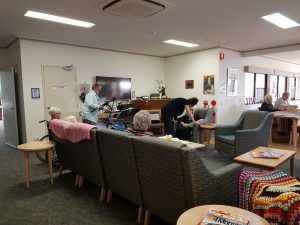 He regularly brings out the didgeridoo, which our residents love. These are just some of the weekly activities at Trevu House. To learn more about the lifestyle options on offer, please give us a call on 1800 52 72 72.